Distinguishing Characteristics Hispanic female. Black hair, black eyes. Martinez has a scar on her left eyebrow. 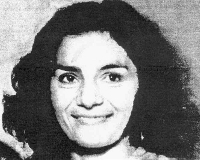 Martinez was last seen in the 1400 block of north Tangerine Street in Immokalee, Florida on August 30, 1990. She left her children with her mother, saying she was fed up and needed to get away. When after five weeks Martinez didn't return, her mother reported her missing. She may have traveled to Texas or Mexico after her disappearance. Few details are available in her case. Updated 2 times since October 12, 2004. Last updated September 23, 2012; alternate weight added, details of disappearance updated.